Phuket is a fantastic destination for a family-friendly getaway. It is easy to get there, there are beautiful beaches, a lively atmosphere, welcoming locals and a large variety of shopping. 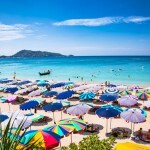 There are also some great attractions in Phuket for families, and it is easy to keep away from the more infamous parts. 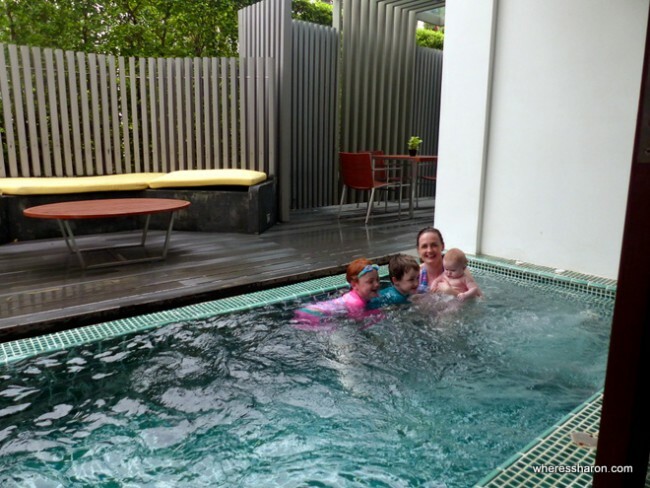 A family holiday in Phuket is sure to be lots of fun! Warning: This article is going to give you a strong desire to get on the first plane to Phuket to visit all these lovely resorts! 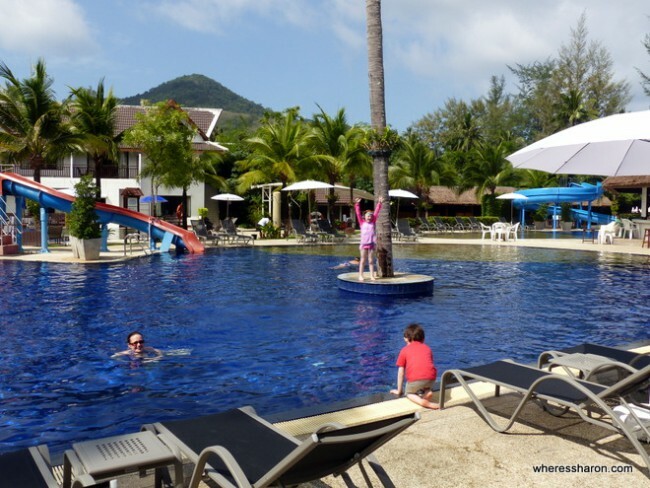 One of the most family friendly places we have ever stayed is the Sunwing Kamala Beach Resort right in the middle of Kamala Beach. 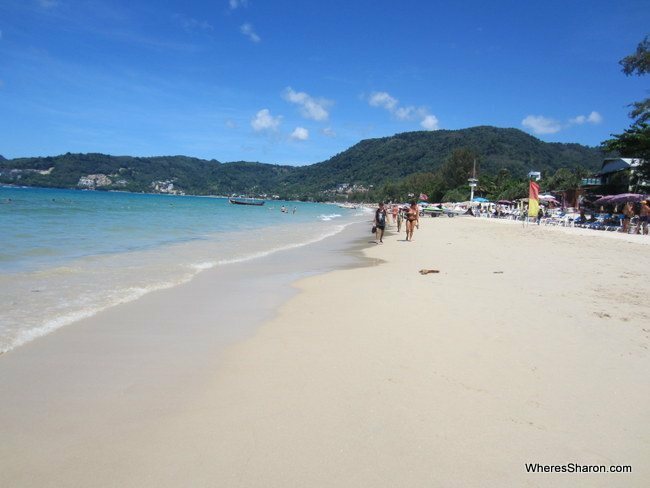 This beautiful beach area is a perfect place to stay for families in Phuket with low key restaurants and massage spots right on the beach, many with toys for the kids. The best part, however, is this resort. There’s an amazing 7 pools as well as a toddler pool. There’s three decent sized water slides, a kids club with activity program, soccer field, massage places, restaurants and much more. There’s a variety of room types. Our favourite thing about this resort is the amazing “happy baby studios”. These rooms are just perfect for people travelling with babies or toddlers as they come equipped with everything you could need including a pram, nappy change pad, bumbo, high chair, baby bath, stool, potty and even a mat with roads so the kids can play with their cars. 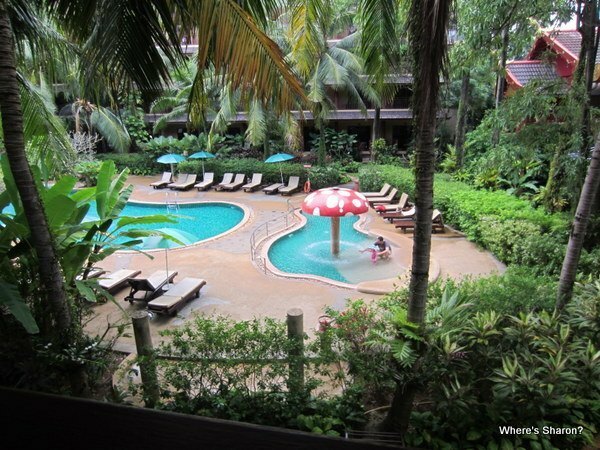 It is a great choice for the best family resort in Phuket. Click here to read our full review or click here to see the latest prices. If you want the combination of a pool villa and fantastic family facilities then this best Phuket family accommodation is perfect. This new resort is filled with spacious pool villas ranging from two to six bedrooms in Rawai, close to the waterfront and many restaurants, shops, etc and a few minutes drive from some lovely beaches. The villas themselves are amazing. They range from two to six bedrooms and have fully equipped kitchens, a lounge area and private pool. There’s a variety of different options and this is particularly a great option for bigger families. The other big win with this resort is Rawai Park. 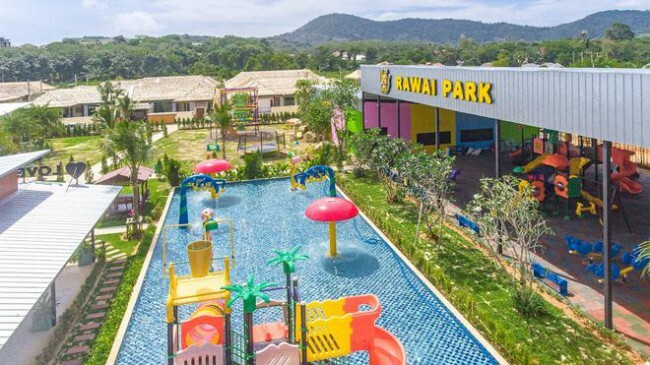 This brand new park has been built just for families and guests of Rawai VIP Villas get unlimited access. The park has four different areas aimed at different age groups including a water park for 2-12 year olds, two indoor playgrounds, one for younger kids and one for older kids and an outdoor rope climbing tower for 10-14 year olds. Combined with all the facilities on offer in Rawai, this is a very easy place to stay with kids in Phuket. 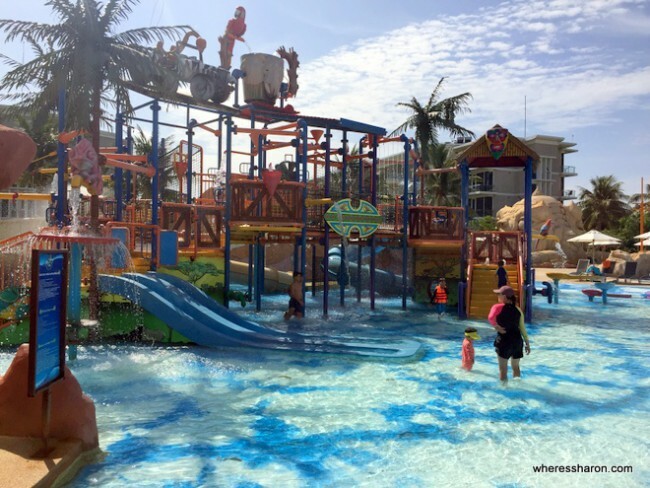 If you are looking for the ultimate in fun Phuket family accommodation then Centara Grand West Sands Resort may be exactly what you are looking for – it is home to Splash Jungle Waterpark. 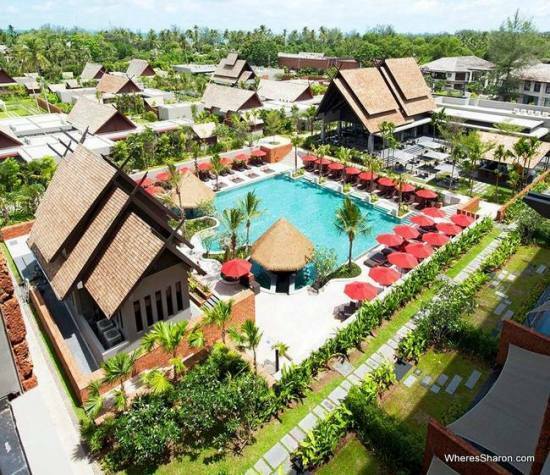 This big resort is located near the airport right on the pretty (and hassle free) Mai Khao Beach. The resort itself has many pools, restaurants and facilites and it so big that it has its own shuttle service! Families will love the kids club which runs from 9am-9pm, the big infinity pool by the beach, the beach itself and the waterpark! Splash Jungle Waterpark is great. It’s a good size with multiple big slides as well as little ones for younger kids. There’s the water playground pictured above, a lazy river and a wave pool as well. Our kids could not get enough. The resort has many different room types. We particularly recommend the deluxe family residence which has a bunk room as well as being one bedroom apartment sized. 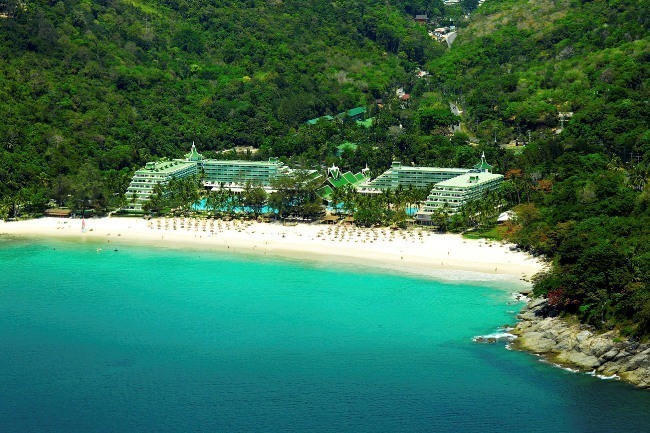 The Kata Palm Resort is an excellent value resort an easy walk from the beautiful Kata beach. We had a great time staying here as a family. There are many room types and this big resort has some great facilities including big pools and a cute children’s pool with a mushroom “shower” (pictured above). There is a small playground and a kids’ club. All this is set in a beautiful garden environment. There are numerous places to eat and drink including a pool bar. The room service is also good value. This is a great choice for families who want a big resort stay near a beach without a massive price tag, and it deserves its title of one of the best hotels in Phuket for families. You can click here for the latest prices. 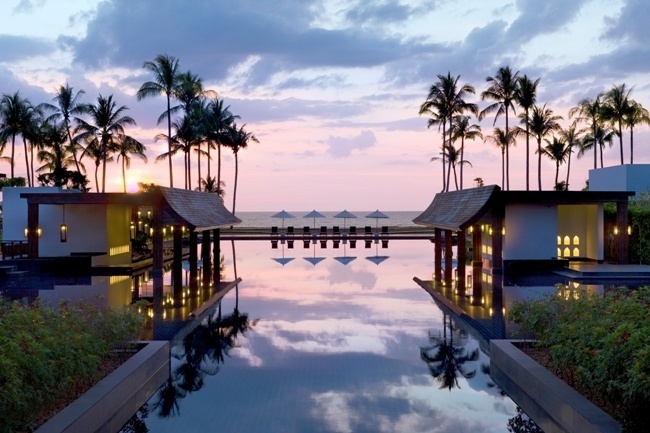 The JW Marriott Khao Lak Resort and Spa is a luxurious Thai-style resort which was the recipient of the 2010 Conde Nast Worlds Top New Hotels award. It is situated on the Andaman Sea’s white sand Khao Lak beach, offering restaurants, bars, a full service spa and many rooms to chose from. The resort has numerous facilities and activities for the family to enjoy, including full spa packages, pools, fitness centre offering many different sports including squash, volleyball, table tennis and more for the kids to enjoy. A baby sitting service is available. The JW Marriott is a great choice for families, with their accommodating family friendly environment providing all the services, amenities and facilities you need to have a comfortable stay. Le Meridien Phuket Beach Resort is situated on its own private beach and provides a vast range of services which are perfect for a family escape. The resort offers several room options including garden views reinforcing a luscious Thai inspired experience. Adults travelling with children will find comfort in knowing that Le Meridien offers great services for children. The resort has it’s own “Penguin Club” which will provide a unique experience for your children. The resort provides daycare services, with programs such as Thai dance, Batik painting and ice cream making. Le Meridien also provides an in-room baby sitting service if needed. Le Meriden’s diverse dining menus aim to cater for all tastes, you will find a range of freshly cooked meals, perfect for those with picky eaters. Le Meridien Beach Resort is a great option with their relaxing, serene and fun filled environment. It is sure to please the family. Click here for the latest prices. The Novotel Karon Beach Resort and Spa is a beautiful family resort with services to cater for all and is located within walking distance to local markets, shops and Karon Beach. The Novotel offers a variety of rooms, covering all requirements, with great family driven setups. There’s dedicated family rooms with fun extras or we loved stayed in a private pool plunge suite which worked very well with our 2 kids and baby. At Novotel you will find numerous activities and services available for your children, with the resort offering a free kids club that provides daily fun filled activities. There is also a video games area for those with teenage children. The resort also offers baby-sitting services for the convenience of couples to get away and appreciate the resort’s relaxing services. There’s multiple pools and even a water slide. Novotel also offers a buffet breakfast with restaurants that offer quality Asian and western cuisine to provide all your dining needs. All in all, a great place to stay with your family, The experienced staff at Novotel will make sure your stay is one to remember. 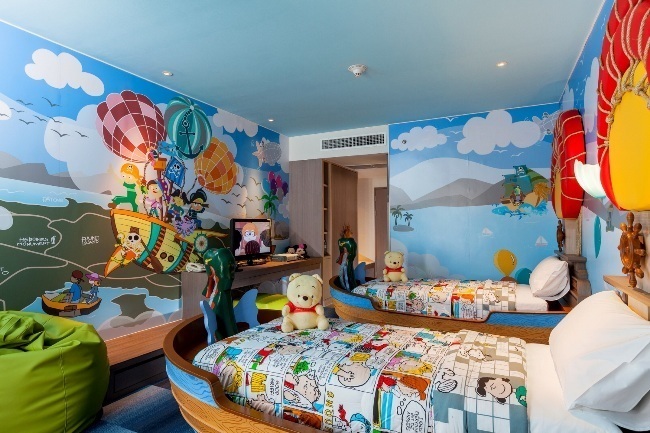 I bet your kids would love to sleep here! The Holiday Inn Resort is one of the best Phuket family resorts. It is centered in the heart of Patong and is just a short walk away from restaurants, shopping, night life and the beach. Holiday Inn is a great choice for families and is popular with kids for its family friendly rooms and numerous facilities. This resort offers some of our favourite family rooms on the island. The resort also provides daily guest activities, dedicated kids’ facilities, spacious rooms offering pool view/access and 4 restaurants providing great value cuisine – the best part being that kids under 12 eat free! The resorts’ tranquil pools and tropical gardens mean you can relax or be active and, with affordable baby sitting services and play areas, the couples spa is a great way to relax away from the kids. Holiday Inn’s warm Thai welcome, friendly service and exceptional standards and affordability makes for some of the best family accommodation in Phuket. Anantara Vacation Club is a brand new signature resort located 15 minutes from Phuket International airport. Anantara aims to please its guests with friendly staff and a welcoming, family friendly atmosphere. The resort has a luxurious choice of apartment suites and villas, perfect to suit the needs of any family. The resort is host to numerous facilities including complimentary bicycles, activity centre, cooking classes, kids playground, childcare services and much more. With so many options, the kids will be well entertained while the adults can soak up the sun enjoying a drink by the poolside bar. The Anantara Vacation Club is a perfect choice for any family, with the choice to spend the day relaxing by the pool or a day filled with adventure and activity. It is sure to make for a great family vacation. The Outrigger Laguna Beach Resort is a serene family resort with direct access to the beach. The resort offers numerous room options to accommodate any budget and family friendly amenities. The Outrigger Laguna Resort provides amenities including outdoor/indoor tennis courts, outdoor pool, children’s pool, in-room childcare, full service spa, games room, restaurants, fitness centre and much more. The resort also offers many sports for those looking for an adventure including kayaking, rowing, windsurfing and more. The Outrigger Laguna Beach Resort is a fantastic option for a family looking for both adventure and relaxation. Click here for more information. Still confused? Read our guide to where to stay in Phuket to ensure you pick the best area in Phuket for your family. 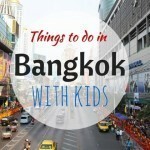 You can also read our complete guide to things to do in Phuket with kids and more about family travel in Thailand. 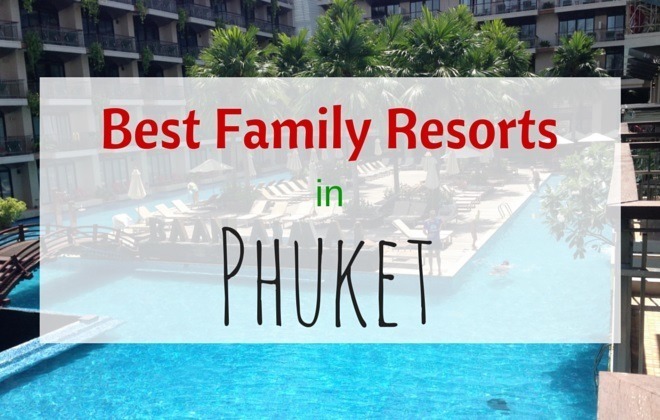 What is your favourite family resort in Phuket? 10 Reasons you should NEVER go on an All Inclusive Holiday! Hi. I would also like to add that our hotel is great for families as well yet affordable. Mostly our rooms are surrounded by a huge pool area where kids can really spend lots of great time. We also provide luxury all suite rooms so that everything will be available at your disposal. Hey, Thanks for your great postings. I travel since 4 years 3-4 times a year to Thailand and since I came first time to Thailand I fall in love with this amazing country. 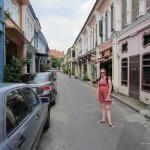 With my old job (now I prefer a Digital Nomad Lifestyle) I already traveled all over the world, but South East of Asia is definitely my future Home…. And I will move to Thailand completely this year. Hi Dirk. Thailand is a great place 😀 So is the Philippines and Germany, but yeah I wouldn’t want to be there in winter! Not long to go until you are away again. Your blog content is very nice and informative. I enjoyed your blog!!! Your blog post looks attractive and very informative thanks for listing the places as well as the price of every hotels that located in Phuket. By looking at ur photos, we can see that the resort and hotel is so cozy and yet relaxing.